It is Day Seven of our Anniversary month at TJ and we're getting PUNCHY! 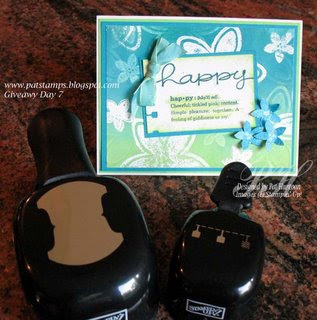 For today's giveaway a day, Pat is offering two brand-new Stampin' Up! punches, plus the card shown, which uses the Double Rainbow Technique from the August TJNL. To enter the giveaway for today, simply post a comment on this blog entry by 11:59pm EST on Monday, October 8th. i'd loveto see onethe the cards IRL so here we go with my 'entry".